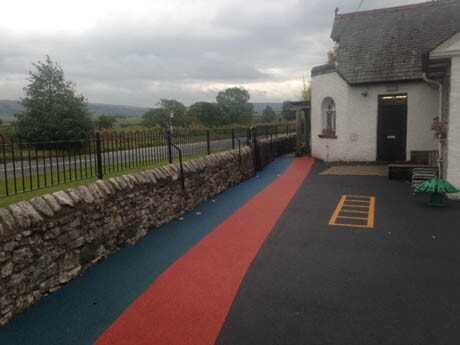 This project was part of the Sport England Primary Spaces project in 2014-16 and Beetham CofE Primary’s scheme was tendered along with another 6 schools forming a sizeable contract. 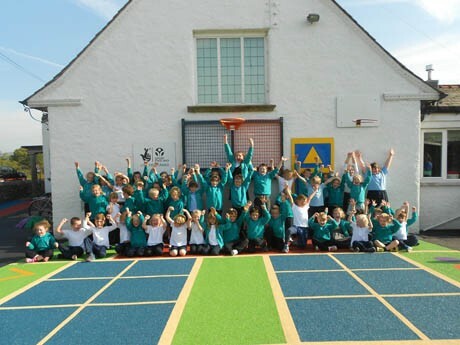 Whilst having been successfully appointed as the playground contractor to deliver this outdoor playground scheme, a major part of the programme was to work closely with the school to redesign the project to fit in with their own site issues. Beetham CofE is in an area of outstanding natural beauty and as such, has stringent planning requirements to adhere to. 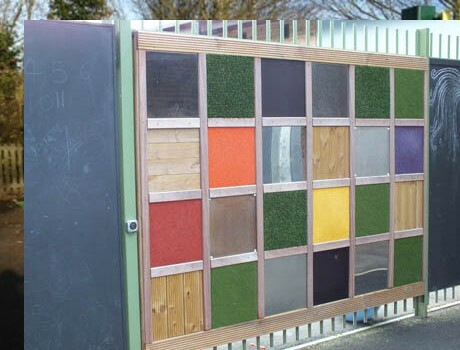 The Primary Spaces MUGA play equipment was adapted to reduce its overall height to ensure it did not contravene the planning regulations and also to enable the multi use goal end to sit below an existing window. The multi coloured graphics panels were wall mounted and provided excellent shooting targets for balls and beanbags. 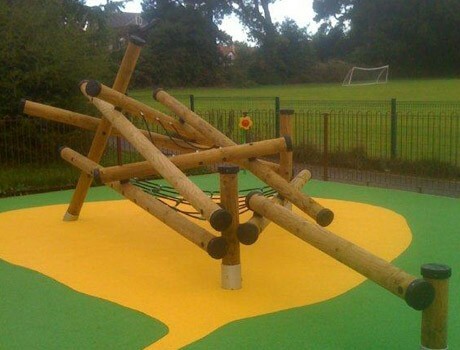 The highlight of the new play area design was the refurbishment of the existing poor quality tarmac play area. 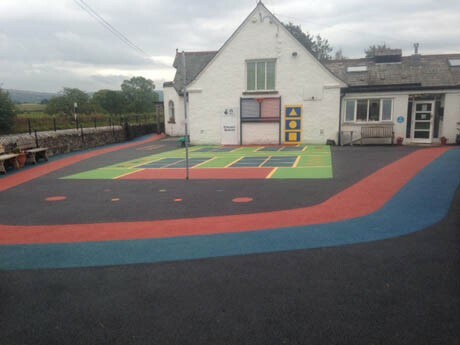 An extensive area of new Flexiplay wetpour safety surfacing was laid to cover all the old, poor tarmac in bright colours, following the design brief from Sport England. 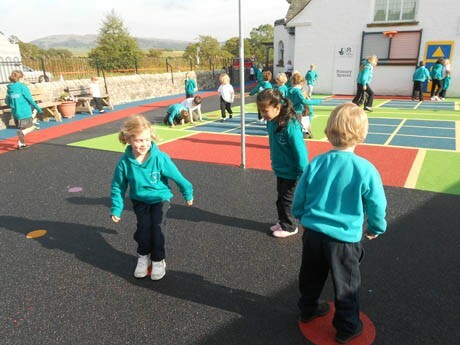 There was an Activity Track in wetpour which was a two way track in red and blue running round the outside of the new playground. 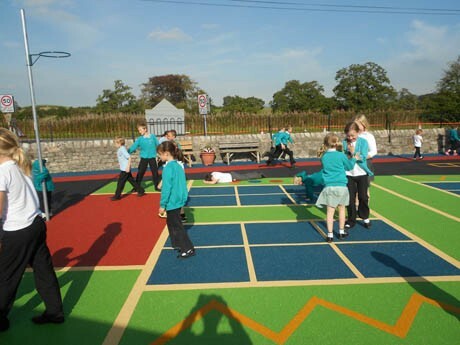 The multi-coloured court markings followed the model of the Primary Spaces PS3, providing numerous grids, squares and zones to enable multi sports coaching and activities. Firstly, I was really impressed with your tendering process. I found Paul very helpful and also able to adapt the ideas that I had to the space available. It was obvious that we would be able to work together to plan the best approach for our grounds to make the maximum impact for the children. The team who came were really great. They were extremely helpful, pleasant and polite and went out of their way to be friendly and accommodating during their time at Beetham. It was also obvious that they were perfectionists and determined to do the very best job that they could. The playground looks amazing and is beyond anything I could have hoped for. The children think it is wonderful and are already playing all sorts of different games. Also whilst we have had good weather they have just enjoyed sitting on it and have started taking lots of crayons etc. outside and enjoyed chilling out on the floor! I cannot say thank you enough for your help with the whole process. To receive the grant was amazing but then to have someone put our scheme into practice and make such a great job of it is just brilliant. All the parents and visitors to the school have commented on how wonderful it is.